When it comes to heavy duty, site ready, products there is no bigger American brand name than DeWalt. 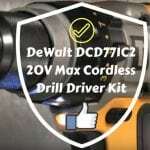 With nearly a century of creating high-quality products, DeWalt caters for the professionals. The DW088K is a 2 way self-leveling cross-line Laser. With independent laser functions, for both horizontal and vertical, and a 90-degree cross angle this laser is built to take on job site conditions. It is self-leveling up to 3 degrees, visible up to 15 meters and with pulse mode can reach 50 meters. Housed in an over-molded plastic casing with a thick glass pane covering the laser, which helps keep the laser calibrated, the DW088K has the dimensions of 6 x 11 x 11cm, weighs 500g, and is extremely heavy duty. It comes with a built-in magnetic pivot bracket enabling you to easily mount to metal surfaces. To operate the laser it is just 2 buttons, it doesn’t get much simpler. It’s powered by 3 AA batteries which are accompanied by a low battery indicator to save inconvenience. use, DON’T buy for outdoor. If you liked this product, see what other people said about it on More Amazon Reviews. Overall if you’re a professional looking for a site worth tool that is extremely durable and simple to use this is the Cross-Line Laser for you.